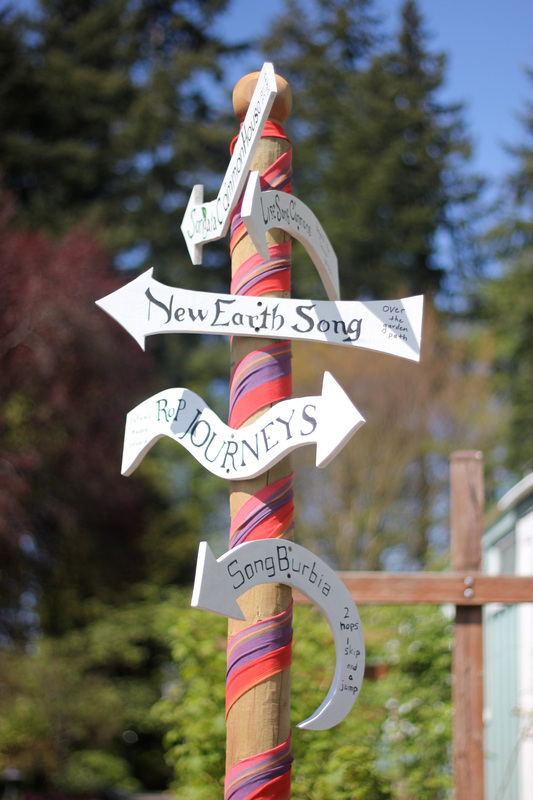 The Songaia Neighborhood is located about 20 miles north and slightly to the east of Seattle. It is composed of 17 homes (6 duplexes and 5 shared homes), which are surrounded by a small forest, organic gardens, orchards, commons and a meadow, plus more. Our multi-generational community was established in 1993 and has grown since that time; we currently have 50 residents. About a year ago, a 25 home development was built right next to us on the other side of our private road. Fortunately, several of our members went in together and purchased two of the new houses. This is the primary way we have expanded the Songaia footprint into what we are now calling the Greater Neighborhood of Songaia and the Songaia Next Door Neighbors community. We also have a Non-Residential Associates program where people who want to relate to Songaia can do so by coming to dinners, participating in work projects and attending celebrations and other special events. By doing so, they participate in the life of our community without having to actually live on site. Our community is active; we gather for five shared meals per week and celebrate, work, and pursue learning together. As a result of these many connections, we have grown to be a strong web of friends and neighbors. We have an ethical commitment to hearing all voices in our community and therefore, use a modified consensus decision-making process and rotational leadership. As a community, we endeavor to create a space that is a supportive environment for people of all ages, backgrounds and interests. Our desire for sustainability inspires us to share resources and skills whenever possible. Members and associates (including non-residents) have access to our extensive facilities and land. The common house includes eating and meeting spaces, two guest rooms, laundry facilities, a playroom for children and more. Our barn has a greenhouse, food pantries, tool shop (woodworking, electrical, auto), ceramics studio and storage. The land is about a total 14 acres comprised of the above mentioned buildings, plus a small forest, wetlands, several organic gardens, two orchards, a food forest on the neighboring development, a central commons area, a meadow, a chicken coop for 20 chicken and a goat pens for 3 goats who earn their keep by eating the invasive blackberries. We also aim to connect with local, regional and national communities. Because of our work to create self-sustaining food sources on our property, we have become involved in the local permaculture and organic agricultural movements. Our community is also devoted to education; we host a vibrant internship program that attracts volunteers from around the world through WWOOF, and also Bastyr University and the University of Washington-Bothell. Songaia has provided land and support for the Rites of Passage Journeys program which conducts programs for youth moving towards adulthood as well as supportive nature experiences for all ages making a variety of life transitions.